Mesh Grill Guards add a great look to the front of your Jeep as well as keeping bugs and small rocks out of your radiator. Rather than spending about $50 for a kit, make your own using this very cheap and easy DIY. 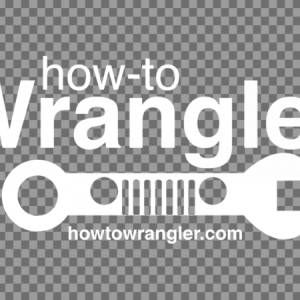 Lift the hood of your Wrangler and you will see six round plastic pieces along the top of the grill. Using the flathead screwdriver, lift the middle round section then remove the entire piece by lifting the larger piece below it. The whole piece should come out and you will see it works like a drywall screw, expanding from below. Repeat this process on all six pieces. The top of the grill should now be loose. Next you will need to disconnect the two turn signals that are in the grill. Reach behind the front tire and you will see the connection as in the image. You will need to slide the red tab towards you first then press the tab and pull to release the wire. Repeat on the other signal. Moving back to the front of the Jeep, grab the grill from the top and side and you need to pop the grill off. There are tabs along the bottom that pop out. You need to use some force, but they will come right out. Bring the grill to a safe location and lay it face down on a towel. Thoroughly clean the inside of the grill with water or a household cleaner. Remove the protective paper to expose the sticky back of the cable mount holders and adhere two mounts between each grill opening and one on the top and bottom of each opening. The adhesive may or may not be strong, but either way it is a good idea to add crazy glue to the corners or back of them to make sure they are not going anywhere. Using the corner of a table or countertop, measure 14 inches in lengthwise and put a piece of tape, then measure 4 inches in depth wise and put a piece of tape, making a 14×4 inch rectangle template. Using the scissors, cut along the edge or your template, starting with the with end to make a 14×4 inch mesh section. Repeat this 7 times to make all of your grill guards. Line up the first mesh grill guard on the left end grill opening. Make sure the mesh is lined up in the direct middle of the opening. Using the zip ties, loop through the second mesh hole from the edge and through the cable mount hole. Leave the zip ties relatively loose so you have wiggle room until you are done. Start at the top of the grill opening, then move to the left side two mounts and finally the bottom. Leave the right side un-tied down. Next line up the second mesh grill guard on the opening to the right. Zip tie the top of the mesh down first. Next line up the left edge of the mesh with the right side of the first one your installed. Loop through both guards and the middle cable mount. Repeat this on the other cable mount below, and finish with the bottom. Repeat this process all the way across. Once they are all installed, tighten down all of the zip ties. Make sure that the ends of the zip ties are pointed up so they will not be seen. Line up your grill by aligning the bottom tabs to the openings in the Jeep. There is a center post that will be very noticeable for alignment. Once you have it lined up, apply pressure to the bottom until the tabs pop back in. You should hear at least 3 clicks to make sure it is secure. Replace the plastic screw like pieces that you removed in the first step by pushing the entire piece in by pressing on the bottom larger piece then pressing in the middle piece to secure it. Reach into the wheel well again and reconnect the blinkers by reconnecting the wire. Once it clicks into place, slide the red tab back in towards the vehicle to lock it into place. You will notice that the blinker on the drivers side has the red tab facing down and on the passenger side it is facing up. Turn on your hazards to make sure that your blinkers are re-connected properly. Enjoy your new grill guards.